NBC 6 Investigator Tony Pipitone offers the latest details related to the deadly bridge collapse. Three months after a Florida Department of Transportation (FDOT) bridge engineer expressed concerns about the design of the doomed Florida International University pedestrian bridge, many of the issues he raised had still not been addressed by the designer and builder, according to newly released documents. In March 2016, FDOT engineer Thomas Andres noted several concerns that the state agency expected would be addressed in the next phase of drawings, called the 90 percent plans. But in June 2016, FDOT rejected the 90 percent plans, citing some of the same concerns Andres had raised in March, according to minutes of a June 30 meeting at FDOT headquarters in Tallahassee. This as FDOT claimed within hours of the collapse that it had done only a ”routine preliminary review” of the project – a claim FIU officials rejected as “misstatements and misinformation,” “fake news” and “so not accurate,” according to emails obtained by the NBC 6 Investigators. The newly released documents reveal new details about the extent of FDOT’s involvement in approving aspects of the project. They show Andres was being asked to comment on design changes as late as September 2017. And the concerns Andres raised in March 2016 about potential cracking and other design issues were not always accepted by the bridge designers. In June 2016, an engineer for bridge designer FIGG downplayed Andres’ concerns that a drain pipe running along the bottom center of the span “will likely create a weak point which will be a crack initiation point.” In a document prepared for a meeting with Andres on June 30, FIGG took issue with Andres’ interpretation, saying, “cracking is not expected to initiate” from the area Andres was focusing on. A professional engineer who reviewed the latest publicly available plans for the bridge design told NBC 6 Investigators that no changes were made to address Andres’ concern about the drain pipe area. In another exchange, FIGG responded to Andres’ concern about forces concentrating at the north end of the main span by saying Andres’ scenario was not possible, based on FIGG’s reading of its design. It turned out that was the same area where failure occurred on March 15, 2018, the result of excessive “shear,” engineers say – the very force Andres was concerned about in that area. When the engineers for FDOT, FIGG and FIU met again in September 2016, one of Andres’ suggestions from six months earlier – involving the inclusion of sloping edges in place of 90-degree edges - had still not been incorporated in the plans as extensively as he had proposed. In handwritten notes sent to FIGG engineers the day after that meeting, Andres said those sloped edges – or “chamfers” – would address a potential for “shear.” Again, shear is the same force that engineers say triggered the collapse. On Sept. 16, 2016, FDOT engineer Thomas Andres recommended chamfers – or sloped edges – be added to the top and bottom of the span that collapsed, saying it would address potential issues with shear – a force that could cause a bridge to collapse. On April 7, 2017 the “for construction” drawings do not show Andres’ recommendation being incorporated into the plans. While FDOT claimed its involvement was only preliminary, the records reveal Andres was being asked in June 2017 to comment on plans that are labeled “release for construction” – far along in the process from the preliminary designs he commented on 15 months earlier. In September 2017, Andres was raising issues with FIGG about how it would pour concrete to create the main span’s deck, asking that the design-build team of FIGG and MCM verify they were doing what FDOT was demanding. 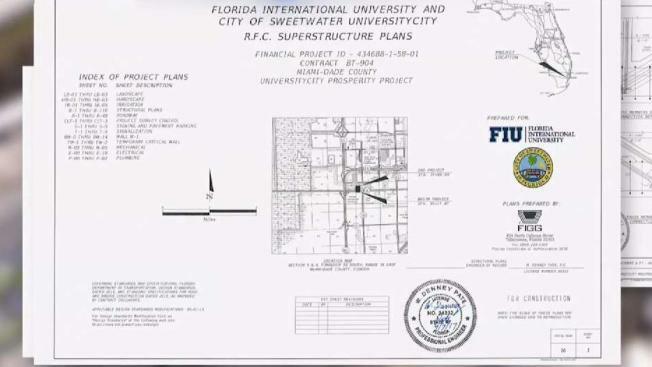 The latest records were released by FIU in response to a public records request by NBC 6. FDOT and Andres have not responded to detailed questions and records requests about Andres’ role in the bridge design for several weeks. FIGG and MCM say they cannot comment while the federal investigation into the collapse continues.